Tay Ho (a prime area) is named after the nearby West Lake, the largest lake in the city. There are seafood restaurants in front of the lake. Biking and motorcycle tours around the lake are quite popular. The Tay Ho Pagoda is the most popular worship site in Hanoi. The way to it is lined with stalls selling food and offerings for the temple. Tay Ho was once the site of palaces and royal rest houses. Today it is an exclusive residential area. Its apartments are much sought after, especially by folks who enjoy the serenity of nature. Flower markets and the Ho Tay Lake Water Park add to the popularity of the neighbourhood. Ciputra Hanoi International City is an integrated residential, commercial, and tourism complex in the district of Tay Ho. It covers 301 hectares and consists of houses, villas, high-rise apartment towers, office buildings, schools, hospitals and health care centres, shopping malls, supermarkets, and entertainment venues. It has sports and fitness facilities such as tennis courts, swimming pools and gyms, a parking area, and security. Ciputra, the biggest development project in Hanoi, is designed to serve and satisfy its large community of expatriate families. The township is very peaceful and secure, and the environment is clean and green. It has a park adorned with flowerbeds, fountains and statues. Ciputra is ideally located near Hanoi’s central business district, and the Noi Bai International Airport. Its high-rise apartments offer marvellous views of the adjacent West Lake and the surrounding area. West Lake (Ho Tay), the largest lake in Hanoi, can be found just north of the Old Quarter. Palaces once dominated the area around the lake, but have been destroyed in the past centuries. Now the lake is surrounded by some of Hanoi City’s most expensive and luxurious hotels. Rapid development has been taking place on the eastern bank area of West Lake, with many beautiful contemporary-style villas and hotels sprouting. This is a favourite area of expats, and they own most of the modern businesses. Xuan Dieu is quite an upscale area with shops, restaurants, supermarkets and luxury hotels. Houses with roof terraces, lake-view apartments, modern flats and condominium units, and villas with courtyards are on offer here. 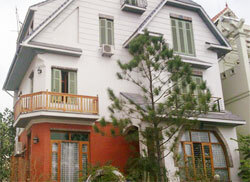 Quang Ba has a number of serviced apartments here, such as the Sedona Suites. In Nghi Tam, fully furnished, three- to five-bedroom homes (many with roof terrace, balcony, courtyard, and parking) are available for rent. They are situated along green and quiet lanes, and some enjoy a lake view. Brand-new lake-view apartments are on offer as well.